The following is a list of all the archives in the Society, in the care of our archivist, Colin Such. They are available to borrow or consult by all members of the society. Those with the suffix E in brackets are available in digital form and there is a link to some of them from this index. LH1 List of documents referring to Warwickshire held in the Public Record Office, the Shakespeare Birthplace Trust Library and Archive (SBTLA) and the Warwickshire County Records Office (WRO) and index of books and articles on Warwickshire. LH14 Notes on the Royal Warks. Regiment and the Warks. Fusiliers. LH15 “Domesday Lighthorne” by Peter Hinman (2000). LH16 Photocopy of transcript of Lay Subsidy Roll of 6 Edward III, Hundred of Kineton. LH18 Extract from transcript of “Feet of Fines for the County of Warwick”, detailing land holdings in Lighthorne from the 13th to the 15th centuries. LH19 Extract from “The Antiquities of Warwickshire Illustrated” by Dugdale. LH20 Extract from “Victoria County Histories”, volume 5, Kington Hundred. LH21 Extracts about Lighthorne from various books on Warwickshire. LH22 Extract from “The Journal of the Diocese of Worcester”, circa 1850. LH23 Extracts from directories: Kelly’s 1896 and 1926; White’s 1850; Spennell’s 1926. LH39.9 Various maps of Lighthorne and south Warks. LH50 Photocopy of map of Warwickshire parish boundaries. LH53 Notes on the flora and fauna of Lighthorne. LH55 “A Topographical Glossary”, being the photocopied appendix of an unknown book, also photocopies glossary from “History of Warwickshire”. LH56 Extract from “Woods, Wolds and Groves, the Woodland of Medieval Warwickshire”, by Sarah J. Wager (1998), with appendix of list of records of Lighthorne. LH84 Various newspaper clippings re Lighthorne. LH87(E) “Origin and Explanation of the name Lighthorne”, by Peter Hinman (1998). LH88(E) “Woodland, Park and Warren in relation to Lighthorne”, by Peter Hinman (2000). LH91(E) “Anglo-Saxon Settlements of Lighthorne”, by Peter Hinman (1999). LH92(E) Extracts concerning the 1398 tenants’ revolt, from “The English Peasantry in the late Middle Ages”, by R.H.Hilton, with comments from DR98 – 676a and 685 at SBTLA. LH94(E) “Abednigo Mitchell and Local Highwaymen”, by Peter Hinman (1998). LH97(E) “Domesday Lighthorne, How the Village was assessed in 1087 AD”, by Peter Hinman (2000). LH98(E) “Lighthorne Time Line”, by Peter Hinman (2006). LH102 Index of the Willoughby de Broke papers held by the Shakespeare Birthplace Trust Library and Archive (DR 98, 41/94 and 31), covering the period 1150 to 1870, compiled by George Smith. LH103 Notes on the history of Lighthorne from the Norman Conquest to 1870, by George Smith. LH107 Photocopies and a few negatives of photos of postcards of Lighthorne. LH108 Reproductions of sketches and paintings of Lighthorne buildings. LH112(E) “Lighthorne Village Sign”, by Peter Amis, supplement to parish magazine, April 2001. LH114(E) The Geology of Lighthorne and its Effect on Settlement, by Colin Such (2013). LH115 Village Design Statement reports and correspondence, 1997 – 2000. LH116 Lighthorne Conservation Area leaflet, by Stratford District Council. LH117(E) List of captions to DVD “Lighthorne, 1900 – 2000, a Century in Images”. LH118 List of trade directories at Shakespeare Birthplace Trust Library and Archive. LH121 Lighthorne Community Post Office 1990-1 awards and photos. LH123 “Joe, the Story of a South Warwickshire Countryman”, by Peter Johnson (2000). LH130 Exercise book recording building work done by Lighthorne resident George Humphriss, between 1904 and 1911, also containing details of 1906 Moreton Morrell Cup football match results. LH131 Minute book of the Lighthorne 1952-3 Coronation Committee. LH132 Invitation card to the Lighthorne festivities to mark the 1953 coronation. LH133 Parish magazines for May 1905 (photocopy of Lighthorne and Chesterton extract only), Jan 1932, Feb 1933, July 1933, Mar 1937 (photocopy of Lighthorne and Chesterton extract only), May 1937, Dec 1937, Jan 1938 – July 1938, Dec 1938, Jan 1940 – Dec 1942, May – July 1943, Jan – Mar 1946, May 1946, June 1946, Feb 1948, May – Dec 1948, Jan – Apr 1949, July – Sept 1949, Nov 1949 – Apr 1950, June – Oct 1950, Dec 1950 – Apr 1951. LH135 Collection of documents relating to the design, construction and use of the Village Hall from 1959 to 1966, including accounts. LH136(E) Photocopy of 1960s brochure relating to hiring of the Village Hall. LH139(E) “Origins of the Working Population of Lighthorne”, by Peter Hinman (1999). LH144 1940s Weekend programme, 2005. LH151 Ordnance Survey 1:10,650 (6 inches to 1 mile) sheet SP 35 NW, including Newbold Pacey, Chesterton, Moreton Morrell and Lighthorne, dated 1955. LH151.1 Ordnance Survey 1:2500 (25 inches to 1 mile) sheet XLV4, dated 1886. LH166 Index and explanation of the registers of baptisms, marriages and burials held at the Warwickshire Record Office and notes on documents referring to Lighthorne held at the Warwickshire Record Office and at the Shakespeare Birthplace Trust Library and Archive. LH188(E) Parish Magazines November 2013 onwards (incomplete). LH189(E) Parish Council minutes April 1997, August 2000 – April 2008 and January 2013 onwards, Parish Council Annual reviews and Newsletters 2001 – 2009. LH194 The Lighthorne village sign 2000 – 2001: correspondence, designer’s artwork, plans and impressions, opening ceremony documentation and photographs. LH196 1856 embroidered sampler made by 14 year old Lighthorne resident Sarah Wilkins. LH206 Minute book of minutes of the meetings of Lighthorne Parish Council, between May 26 1952 and January 14 1964. LH207 Sports ground planting project, 2003-4, correspondence, plans and photographs and award certificates. LH208 Lighthorne Parish Council 1999 – 2002 correspondence concerning boundary changes and the splitting of Lighthorne and Lighthorne Heath parishes. LH209 2008 copy of the agreement for the purchase of the telephone kiosk from BT. LH210 Electoral boundary review correspondence, minutes and maps, 1995 – 2003. LH211 Parish Council correspondence re Countryside Right of Way Act 2000 in relation to remaining heath land in parish and CRoW brochures and local maps showing rights of way, also Parish Paths Partnership correspondence, 1998 – 2002. LH212 Correspondence concerning the gift to the Parish Council of the Goode land in Church Lane, 1993. LH213 1997 agreement between John Boom and Parish Council re land on village green. LH214 Lighthorne Sports Club leases, correspondence and agreements, 1975 – 1997. LH220 Residents’ Reminiscences – Barbara Townsend (late 1990s). LH221 Map of proposed route of M40 between Banbury and Warwick, published by the Department of Transport (1985). LH222 Various photographs of Lighthorne, including aerial views, ca. 1995. LH223 Boundary review material: Stratford District Council Electoral Review 1999; correspondence concerning review of Lighthorne / Lighthorne Heath parish boundary 2001; map of Warwickshire re electoral boundary review 2003. LH224 1995-7 correspondence between Keith Sheppard and various bodies re inaccurate mapping of Lighthorne. LH225 Lighthorne Conservation Area report by Shankland Cox for Stratford District Council (1994), also a photocopy including appendices and photocopied maps. 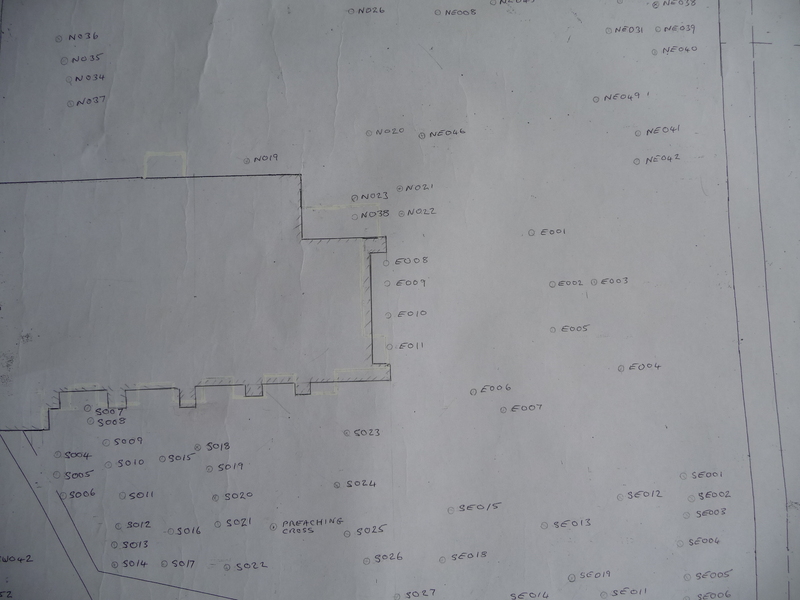 LH226 Correspondence and draft of Lighthorne Parish Plan (2011). LH2 Warwickshire Museum Sites and Monuments Record for Lighthorne, 1997. LH3 Warwickshire Museum Sites and Monuments Record for area around Lighthorne, 2001. LH47 1983 report of Roman villa at Hill Farm, by P.M. Booth and poor quality photocopies of 1878 aerial photographs of site. LH47.1(E) Digital scan of 1978 aerial photograph of site. LH69 1956 notes of a discussion in 1923 with Robert Hutchings about finding skeletons in Oldborough Field and Great Mill Field. LH93(E) “Civil War Coin Hoard, found 1972”, by Peter Hinman (2000). LH95(E) “Stone Age Lighthorne, the first known Villagers”, by Peter Hinman (2000). LH96(E) “The Nine Guardians Ritual Burials in Owberry Field”, by Peter Hinman (2000). LH122 Reports of items found on Sir Adam Butler’s fields in Lighthorne and Chesterton parishes by the Coventry Heritage Detector Society, 1999-2001. LH137(E) List of Lighthorne ancient burials and comments by Peter Hinman (1998). LH143 Photocopy of 1933 abstract of 1856 conveyance of a messuage and farm in Lighthorne, from Lord Willoughby de Broke to Rev. Edward Golding and Matthew Malcolm. LH152 Photocopy of report by Warks. 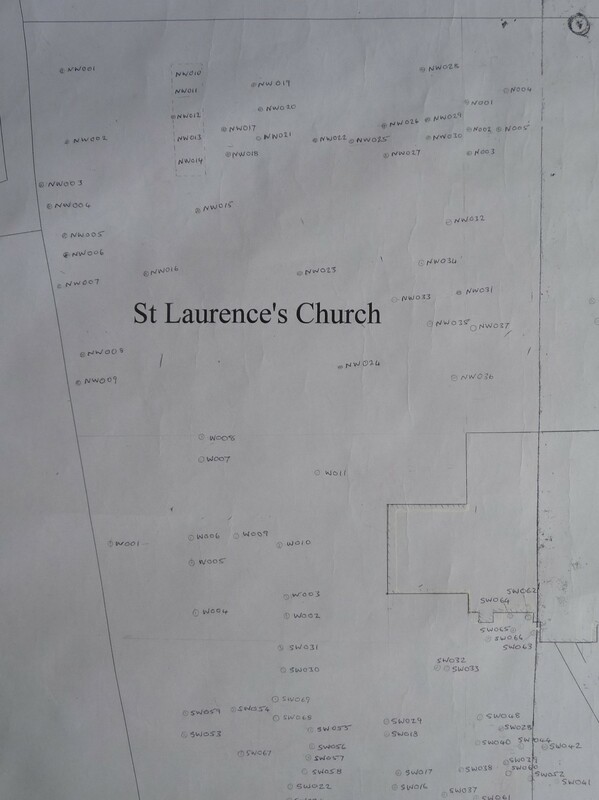 Museum Field Services (2002) of Archaeological Observation at St. Laurence’s Church. 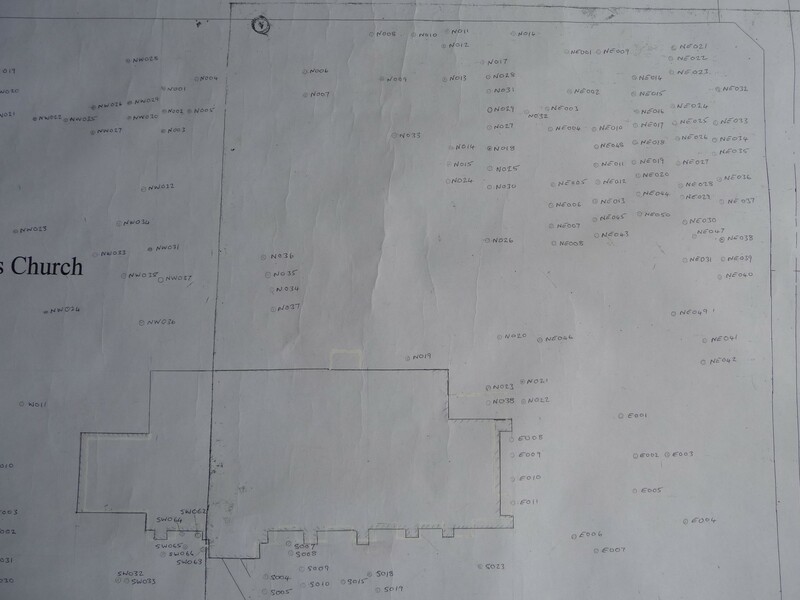 LH197(E) “Report of Geophysical Survey at Hill Farm, Lighthorne”, by Stratascan, August 2015. LH124 June 25th 1929 James Styles & Whitlock auction catalogue of the Compton Verney Estate sale, together with sale plan no. 1 (Lighthorne, Compton Verney and Combrook) and sale plan no. 3 (Lighthorne) and a photocopy of sale plan no. 2 (Combrook). LH125 Photocopy of September 10th 1929 James Styles & Whitlock auction catalogue of the Compton Verney Estate sale. LH126 Photocopy of the June 24th 1930 James Styles & Whitlock auction catalogue of the remaining portions of the Compton Verney Estate. LH154 Tuesday 24th June 1930 auction lot purchase agreement by Robert Kerruish for lot 20 in the Compton Verney Estate sale. LH4 Photocopy of original entry for part of the 1901 census for Lighthorne and transcript by Peter Hinman of entire entry for Lighthorne. LH4.1(E) Transcript of above, by Colin Such. LH5 Photocopy of original entry for 1891 census for Lighthorne. LH6(E) Photocopy of Mormons’ transcript of 1881 census for Lighthorne. LH6.1(E) Transcript of above, by Colin Such. LH7 Photocopy of original entry for 1871 census for Lighthorne. LH8 Photocopy of original entry for 1861 census for Lighthorne. LH9 Photocopy of transcript of 1851 census for Lighthorne. LH165(E) 1911 census return forms of Lighthorne families. LH11 Photocopy of 1994 Warks. District Council Conservation Area Review, prepared by Shankland Cox, with a description of Lighthorne buildings. LH35 Photocopy of completion statement for 2 Church Cottages from the Verney estate auction (lot 94A), by Mr. Hunt, circa 1926. LH79 Pevsner draft entry and sources by Chris Pickford (2010). LH81(E) Village Time Walk, by Peter Hinman, with additions by Colin Such. LH163 1948 estate agent’s details of Bishops Farmhouse and Bishops Farm Cottage, when placed for sale by Ivan Bennell. LH201 Housestyle Countrywide Ltd “Farrier’s Way” development sales brochure, 2016. LH203 Architect’s plans for alterations to 4 and 5 Church Hill Court, 2007. LH216 Estate agents, Victoria Jeffs, sales brochures of houses sold in Lighthorne between 2012 and 2017. LH12 Extract from “The Church Bells of Warwickshire” by Tilley and Walters (1910). LH27 Photocopy of 1718 pew agreement and list of subscribers. LH38 Notes and correspondence re Peter Smart (1569 – 1652). LH40 1976 St Laurence’s Church centenary festival programme and notes. LH63 Photocopies of various sketches and engravings of the church. LH64 “Feast of St Lawrence, Deacon Martyr, August 10”, transcript of web page by Katherine I. Rabenstein (1998). LH65 Notes and correspondence on stained glasss in Lighthorne church. LH80 Historical notes on the church and bells. LH82 Holy Week and Easter 1956 programme. LH83(E) “Welcome to Lighthorne Church” pamphlet. LH89(E) “Peter Smart – Puritan Divine”, by Peter Hinman (2000). LH100(E) “Peter Smart – Puritan Activist, born in Lighthorne”, by Peter Hinman (2000). LH101(E) “The Glass of Lighthorne Church”, by Peter Hinman (2000), including notes on glass manufacture and glazier Nicholas Eyfeller. 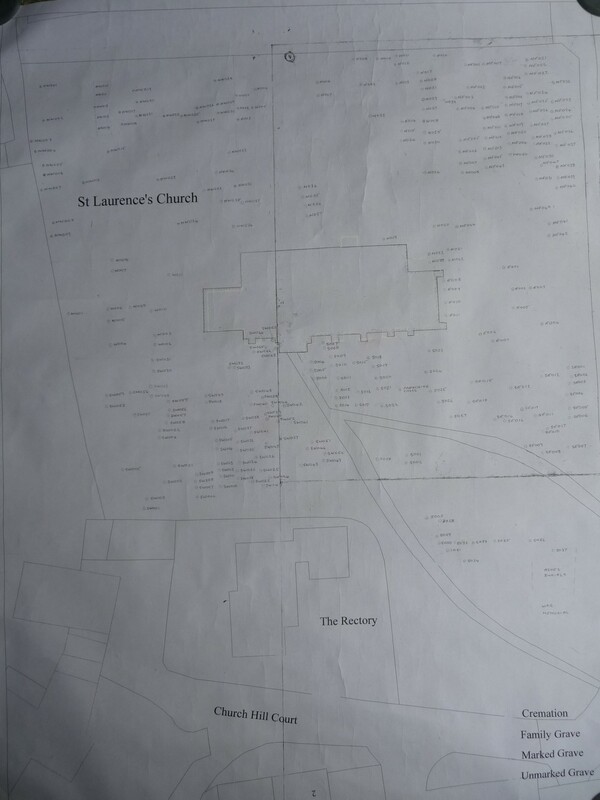 LH119 Description of St Laurence Church by the South Midlands Group of the William Morris Soc. (1999). LH120(E) “The Church of St. Laurence, Lighthorne, a Report on the Bellframe”, by Chris Pickford FSA (2006). LH127 Photocopy of December 10th 1772 faculty or license for the demolition of the old church and its rebuilding. LH128 Photocopy of January 1st 1773 faculty or license for the demolition of the old church and its rebuilding. LH128(E) Transcript of the above document. LH129 Photocopy of January 1773 intimation to the congregation of the granting of a faculty for the demolition of the old church and its rebuilding. LH129(E) Transcript of the above document. LH140 “Easter Monday, 1905”, by Peter Hinman (1999). LH141 “Lighthorne Church”, by Peter Hinman (2000). LH142(E) Notes on St Laurence Church by Peter Hinman and list of references in various archives. LH148(E) Lighthorne memorial tombstones located and plotted by Lighthorne History Society, 2011-14, with amendments 2018. LH150 Monumental Inscriptions, St. Laurence Church, Lighthorne, Warwickshire, by Birmingham & Midland Society for Genealogy & Heraldry (1985) click here for details, together with a copy of a record made by the Rev. Harvey Bloom, early 20th century, deposited at Shakespeare Centre as DR41/16. LH158(E) Original artwork and correspondence concerning the Vicky Stephenson memorial window by Christopher Lund (1995). LH178 Order of service for the dedication of Lighthorne’s peal of bells, November 26th 2006. 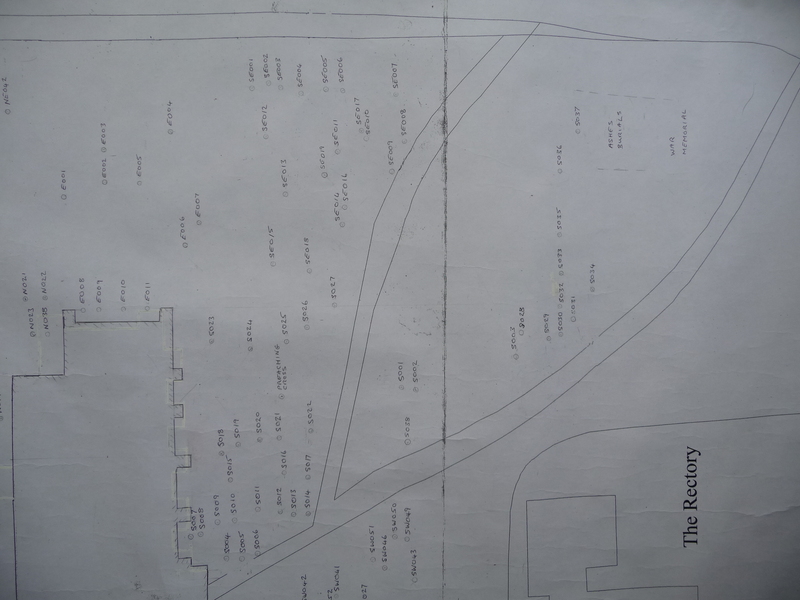 LH13 Transcript of Lighthorne Ecclesiastical Terriers for 1586, 1616 and 1714, detailing land holdings. LH42 Photocopy of map of Lighthorne ridge and furrow. LH43 Photocopy of 1930s map of Lighthorne fields and list of field names. 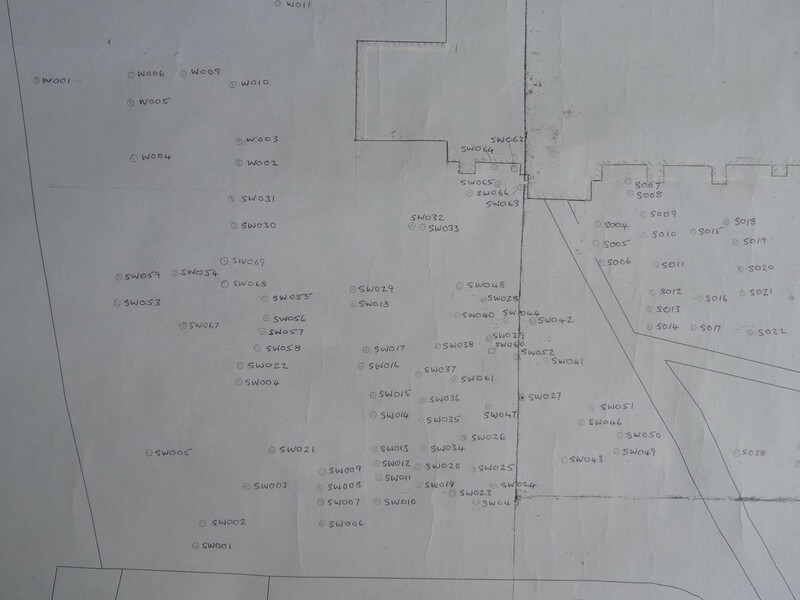 LH46 Photocopy of undated Combroke farm field plan with details of planting. LH54 “Common Fields and the Process of Enclosure”, an extract from “English Field Names”, author unknown. LH99(E) “The Field Names of Lighthorne Parish”, by Peter Hinman (1999). LH28 List of Lighthorne wills, 1538 to 1871. LH29 “The Greens of Lighthorne” by Anthony Cooper (1988). LH70(E) List of names on Lighthorne war memorial. LH85 Correspondence concerning the Boyles family genealogy. LH86 Olorenshaw family genealogy and correspondence. LH145(E) The Olorenshaw Family of Lighthorne and Draycote, Warwickshire, by Jill Prime (2009). LH146(E) Notes on the Talbot Family of Lighthorne, by Maurice White. LH147(E) Details of some old Lighthorne Families, by Peter Hinman (2001). LH156 Hunt family genealogy and notes. LH167(E) Talbot family genealogy by Dale Talbot. LH185 Photographs and Punch cartoon of Major Norman Huttenbach, Master of Hounds and resident of the Old Rectory in the late 1920s and early 1930s. LH193(E) Two Interesting Lighthorne Postcards, by Colin Such (2015). LH199 Genealogical details of the Manton family, 1539 – 1684. LH227 Parish of Lighthorne photocopy of electoral roll, probably 1940s, certainly pre March 1947. LH170(E) Scan of 1538 – 1602 register of baptisms, marriages and burials. LH171(E) Scan of 1597 – 1678 register of baptisms, marriages and burials. LH172(E) Scan of 1667 – 1733 register of baptisms, marriages and burials. LH173(E) Scan of 1715 – 1781 register of baptisms, marriages and burials. LH174(E) Scan of 1770 – 1815 register of baptisms, marriages and burials. LH174.1(E) Scan of details of the Verney vault at St. Laurence’s Church from the parish register. LH175(E) Scan of 1813 – 1825 register of burials. LH176(E) Scan of 1825 – 1838 register of baptisms and burials. LH177(E) Transcription of burials register, 1942 to 2011. LH192(E) Scan of 1836 – 1899 register of burials. LH73 Notes on Ugandan Asians at Gaydon, 1972. LH52 Brochure and plans about proposed housing development at Lighthorne Heath by Tom Pettifer Development, in 1989 and other planning applications and correspondence. LH75 “Royal Air Force Gaydon, a Brief History”, British Motor Industry Heritage Trust (2001). LH90(E) “Lighthorne Heath Airfield and Settlement”, by Peter Hinman (2001). LH138(E) Notes on the crash of a Victor bomber at Combrook, in 1962. LH180 Documents concerning the Stratford-on-Avon District Council proposal for a new town at Gaydon/Lighthorne Heath and FORSE opposition documents. LH204 2015 Outline Planning Application, on behalf of IM Properties Ltd and Feldon Herbs Ltd, for the construction of 1000 houses on land adjacent to the Old Gated Road at Lighthorne Heath, by Stangate Planning. LH74 “The Windmill and the Wellington Bomber” by Keith Douglas (2001) and photocopy of Wellington pilot’s handbook. LH57 Press cuttings and notes concerning the Barn Hill Motorway Services protest, 1988. LH104 “The Church of St. Giles”, being an extract from “A History of the County of Warwick: Volume 5, Kington Hundred” (1949). LH106 “The Chesterton Windmill” leaflet by Warks. County Council (1995). LH113 Report on the archaeology of Chesterton, by Warks. Archaeology Research Team. LH205 Album of photos, clippings and correspondence relating to the Barn Hill Quilt, made by local residents and raffled to raise funds for the Barn Hill motorway service station protest, by Margaret Dews, 1988-89. LH217(E) 1928 – 1956 scans of correspondence between the Willoughby de Broke Estate Co and Warks. Couty Council and the Ministry of Works, regarding repairs to Chesterton windmill, catalogued at the National Archives as WORK 14/1529 Office of Works and successors, Chesterton Windmill 1928-57. LH218(E) Scan of cutting from the Leamington Spa Courier 16.9.1949, concerning restoration of Chesterton windmill. LH77 Photocopy of “Historical Notes on Compton Verney Church”, by Miss E.M. Mills (1932). LH78 Photocopy of the 1954 article in “Country Life”, “The Compton Verney Glass”, by H.T.Kirby. LH161 Extract from “Shakespeare’s Land” by C.R. Ribton Turner (1893). LH162 Photocopy of 1931 Christie, Manson & Woods auction catalogue containing stained glass from the Compton Verney chapel. LH109 Range of Lighthorne Drama Group programmes, poster and press clippings from the early 1980s to date. LH110 Range of photographs of Lighthorne Drama Group productions of the early 1980s. LH164 Accounts and documents of the Lighthorne Boys/Youth Club, 1959 – 1963. LH186(E) Captain Bruce Bairnsfather and his association with the Lighthorne Drama Group, by Colin Such (2014). “Lighthorne, A Short History”, by Peter Hinman (2006). The society has a few copies left at £3 each + postage. The website version is available here. “Yes, we remember it well!” a Lighthorne anthology of reminiscences of the 1940s, by village residents (2008). Currently out of print, but it can be viewed here. “Lighthorne 1900 – 2000, a Century in Images”, by Colin Such (2010). DVD available from the society at £5 + postage. “Welcome to St. Laurence’s Church Lighthorne” by Colin Such (2013). A short guide available from the church. The society has a few at £1 + postage.